Click on a title for reviews in that area, or on "REVIEWS" to return to the main reviews page. We used picture books in our homeschool because they are a joy in and off themselves. They create a learning atmosphere. But sometimes they are can be used more specifically to introduce a study topic. Here is one example. When giving my children an appreciation of American poetry I included a selection of poems of Emily Dickinson. And I read the picture book, Emily. Barbara Cooney is a favorite folk-art illustrator of mine. I like how the author, Michael Bedard writes a-touch-poetically himself. An observant young girl tells the tale. She is about seven-years-old and lives across the street from the big yellow house. When her mother is invited to come and play piano in the parlor of the yellow house the little girl comes along. It was wintertime. “The road was full of mud and mirrors where the sky peeked in on itself,” the little girl says. Once inside, when no one is looking, she tiptoes up the stairs and meets the reclusive lady who, she was told, not many see fact-to-face, who dresses always in white, who likes flowers and who writes poetry. She is Emily Dickinson. Friendship seems to be the theme of Emily as well as a child’s pleasant relationship with her parents. What a sweet story. Have you been keeping a pair of knitting needles and a skein of wool in the back of a closet for years, along with wishful thinking? All that is separating you from learning to knit is an hour of leisure and a knitter. I found the knitter. All you need do is find the leisure. After sitting through a number of DVD teachers I’ve chosen Nici McNally for you. I think you will like her presentation as much as I do because Nici is not a hired actress. She genuinely loves to knit and enjoys sharing her skill. This is evident in the clear, congenial way she demonstrates each step with close up photography. Other DVDs are preoccupied with the razzmatazz of distracting entertainment. With Nici you can peacefully focus on your knitting by pausing the DVD. “Press play when you’re ready,” she says. “Take all the time you need. Don’t worry. You don’t have to get it right the first time,” she says and provides you a way to fix mistakes. May your newly acquired skill bring you just as much joy and satisfaction. Once you’ve learned you can teach your children, too. As a seven-year-old, one of my favorite pastimes was catching frogs and toads. The poor things lived in a box with moss and rocks until my mother made me set them free. Even now, I will scoop up a toad if it chances across my garden path. This is why, at age seven, when my mother introduced me to the Frog & Toad early reading series, I was eager to do my reading lessons. Arnold Lobel reads expressively and unhurriedly – just right for young children. Since he wrote the four books in this collection it is no surprise his expression is exactly suited to the moods of his characters, Frog and Toad. But essentially these stories were created to be simple enough for a child to read. Hearing written language is a boon to children learning to read. It isn’t cheating for a child to hear a story read aloud that is later to be read by him. Many components other than “sounding out” go into learning to read and imitation is one of them. Frog and Toad help one another through (humorous) predicaments that arise. Whether by purpose or by accident, conflict is resolved in the end. 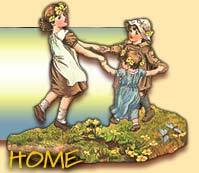 By these stories children learn what it means be a friend. Listening to “A Lost Button” made me laugh out loud. The musical accompaniment is light and tasteful. No “beep” interrupts the reading to indicate when a page should be turned. Therefore a parent or sibling will turn the page of a book for the child or the child will be invited to follow along and turn the pages for himself. Get yours now before it goes “out-of-print.” You’ll wish to save it for your grandchildren. 90 minutes of reading on 2 CDs. Each little story is an average of 4 minutes in length. Arnold Lobel’s picture books have been entertaining countless children. You may be familiar with his Frog & Toad Are Friends but have you seen Fables? Children warm up to his sense of humor because his animal characters do strange and silly things. But his fables aren’t just funny. Each contains a word of wisdom. “That’s clever,” the reader will respond. In keeping with the style of a classic Aesop fable, Mr. Lobel ends each fable with a moral that is timeless. After reading aloud a fable to my young son I’d withhold the moral. I’d first invite him to make an intelligent guess. His guess would sometimes “sort-of” come close. A first failure may prepare the way for later success. A locked door is very likely to discourage temptation. Wishes on their way of coming true, will not be rushed. Because fables are short and meaningful they are just-the-ticket for a new narrator. I was happy to find how well Fables did the job of providing something interesting for my young son to narrate. Narration is an important comprehension skill I wanted him to develop. (To narrate is to tell a reading back in one’s own words.) Twenty, two-minute fables provide twenty convenient exercises in narration and twenty words of wisdom to ponder. With or without a narration Fables is a good read. Years ago I gave my girls a story starter. I was amazed at the results. They wrote in ways they had never written before. It was only when I gave my son a particularly exciting story starter that his creative writing, too, began to “take off.” Therefore I am happy to present you with the same kind of writing exercises in my new book. I sought to put the right ingredients into my story starters to inspire even the reluctant writer or the student who has experienced discouragement. Why does a story starter work so well? Each story suspends the student in the middle of a predicament. He is then faced with the question “What happens next?” This is his cue to expand and embellish the story however he wants. He learns to write freely, with imagination and zest—and with far more boldness than he may be accustomed to. The action-packed stories are especially appealing to boys. Thumb through the pages to choose whatever story catches your fancy. My large selection is meant to satisfy the varied interests of both boys and girls. To spark even more curiosity, each story is illustrated with one or more engaging 19th-century pictures. The settings are sometimes intense, sometimes funny, sometimes sweetly domestic, but they always pose a challenge. Here is your child’s opportunity to rescue those in danger, comfort the sick, cheer the lonely, laugh with the ridiculous, tame the wild, and do battle for good. 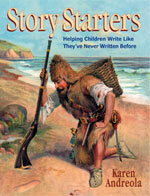 Awaken the dormant writer in your child with this lively approach to creative writing! Story Starters is a one-book-per-family, non-consumable, lavishly illustrated, multi-skill level, supplementary English course. For grades 4 through 12—with tips so younger siblings can participate. 460 pages.